TIME FLIES..WELL YES..AS LIFE EVOLVES..
Time flies, yes we all know. And like most aspects of life, it elates, as well as pushes us to go for some deep retrospective thinking, taking stock of the hindsight, taking stock of the days gone by in the recent past. And it helps, in times, when rough days linger and you say time flies. It has the vitality to make you feel you weathered well the vibes of the hostile times. Life is always slogged with reflections – the personality and its other aspects of the prevailing times. On turning philosophical – philosophy is a way to look at things with a leverage to look at them in your own way – giving you the leverage to scale the scope – for everything – in all realms – personal, metaphysical – hope, scope, score on the scale of time. On philosophy detaches – that is a way to look at it, the way that has been famously philosophical about philosophy – but the beauty of philosophy is – it also allows you to develop your own philosophy giving you the liberty to work on your own ways and definitions to look at attachment and detachment – to feel about what may be the factors behind our feelings to feel so. On taking away certain aspects like passion, persuasive instinct – well, what I think, the days keep on evolving and thus shaping – so, something that was this way causing something to happen this way may well be ‘something’ that way causing things to happen this way – and yet, we may see points of relevance. Life has always been circum-navigational in its approach – and a more eventful life, with share of both, ups and downs, makes the evolution more in sync with you, makes it even more intense. The God is within you and nowhere else – if one is willing to devolve in order to evolve – travelling from devolution to evolution. The unseen remains the unseen and yet you have to strive for it to be seen. On we strive or we have to strive – it is both ways – we strive or we have to strive – even if we are forced not to strive – or even if we do not will to strive – because the circum-navigational passage of life makes it so – making us feel insecure in bouts – and striving comes in then – when it becomes a way where you are looking at some possible recourse – or for the ways to come across, to go over. Striving as an endeavour in life – it is always there, right from the age we become able to take instructions and later on adding our thoughts to them and further later on when we devise our own instructions – it is just that the intensity of realization keeps on taking different hues – depending on which phase the life is in. On following pre-designated plans – but then that is a way to look at if it is pre-designated – that is what it goes like, and it is natural to be so, even the diehard individualists and postmodernists come across the moments when they accept the elements of faith and destiny in the evolution of their thought-process, in shaping their continuum to live it on – that is being human, that is being natural – we all are like that. In any lifetime, there can never be a uniform way to go along. We are what we feel about us today and what we want to feel us about tomorrow based on what we felt about us yesterday. Beyond there lies our limit to think in definitive terms – to think in definitive terms where our thinking acquires elements of vagueness has undefined elements of time. A way to look at it is the consistent life discourse on our reflections on ‘need and want’. I try to focus on in real time – on three days – yesterday, today and tomorrow – while the routine of the thought-process continues with its routine of going beyond – even to the realms of death – and back. REFLECTING ON..AS A YEAR COMES..
And the pleasure is all mine..
A YEAR GOES BY..REFLECTING ON.. It was 365 days ago, the Tuesday on December 31, 2013, the day of symbolic transition of time, from one to the next milestone, from a year to the next, on the timescale, designed to keep track of times our lives pass through, that I was writing a poem, ‘A Year Goes By’, musing on the days the year had for me. Doing so is always existentially individual. And here is the Wednesday of December 31, 2014, with an hour left. Like any other event of life, it is for the perspectives that what we think on this day, how we reflect on the days gone by. Practically, it changes nothing much, apart from the psychological symbolism that gives us the frame to look back, to reflect on – on what was a year in life, a capsule of time, adding to the story of our existence, adding stories as the year proceeded, adding elements as the days changed the calendar entry. And it is never a zero-sum game – positive or negative, you gain something, in terms of experiences – vital enough to guide you if you can hear the call. I had not thought of any resolutions on December 31, 2014, like I always did. Yes, I had my reflections and accordingly had certain stopovers to head to, but there was nothing in the realm of ‘pinned’. Instead, it was living life fully, my way, every day. How successful I have been? Now success is a relative term and should be left to personal, intimate considerations. Like every life, I had my share of good and bad and routine but I didn’t see any point, like always, to assess my life in ‘gain or loss’ terms. I could do what I had thought to do. I could not do certain things that were in my mind. But I could continue doing certain things that I needed to do. I wrote freely, extending and building on my way of life, going deeper inside me, on the journey to reclaim me that had its origin on a day, exactly four years ago, December 31, 2010, a setback that first pushed me to question my identity vehemently, setting me thus on the path to find who I was before the reason of the setback had taken over my thinking, and later on, became the light to guide me to go even deeper inside, in my own company. Yes, the identity crisis was over a long ago but identity is a lifetime love. 2014 saw definitive development on my books, two of them I am working on. The flow was good initially and I had thought I would be able to finish the drafts by the year end. But, then the writer’s block crept in (if I can claim to have one ). So, while the thoughts kept on building and finding space in my notes, the drafts didn’t progress to completion. Anyway, the block is over now and I think I am going to take it with the same love I had. Meanwhile, I could finally bring up my website – http://www.santoshchaubey.com – to extend my blogging experience to a formal and diversified content platform. Some of my content is already categorized there and as I am going to take it as extension of my notebooks, it will see constant experiments and updates. 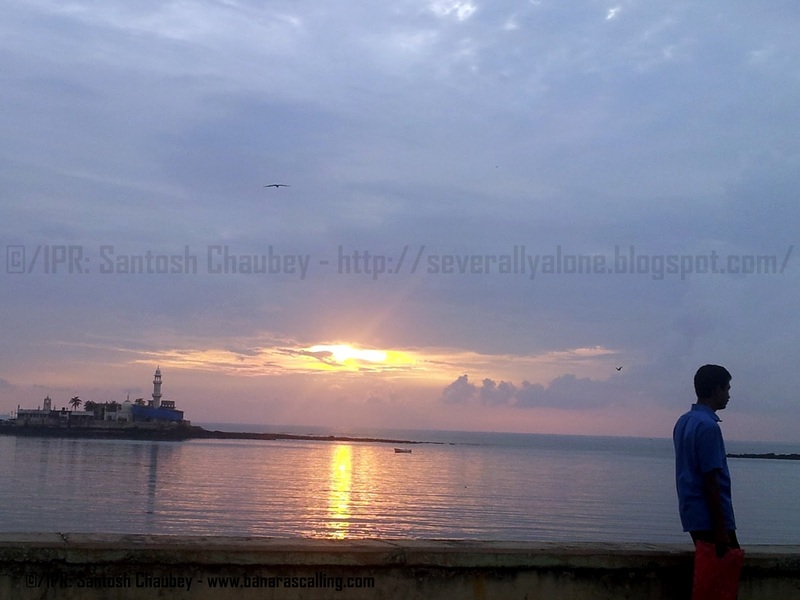 Writing is relief and release and I explored the canvas for newer realms and blogging continued to have some of its share through my regular blogs – http://severallyalone.blogspot.in/ and https://santoshchaubey.wordpress.com/ – and my themed blogs – http://www.banarascalling.com/ and http://santoshchaubey.tumblr.com/ – with 550 posts including – articles, poems, photographs, experimented images and quotes. For my first blog, ‘Beyond This Life’ or ‘Severally Alone’ (http://severallyalone.blogspot.in/), it was also the third ‘no breaks’ calendar year in a row. During the course of writing, I did something that I had not done in years. I don’t remember the last time when I had watched a full movie in theatre. I prefer the home video option, even if it means some wait. I am not a film buff but I admire and revisit the good cinema and home videos give me the liberty to do so at my own pace while at the same time help me in building my library. But 2014 had the final episode of JRR Tolkien’s Middle Earth story, as filmed by Peter Jackson, scheduled in December. It was capping the second Middle Earth trilogy of Jackson’s stint with Tolkien’s land of fantasy after 11 years when the best of the lot, ‘The Lord of the Rings: The Return of the King’, a landmark in narrating a book on screen, was released in 2003 and there was an urge to see the trilogies side-by-side, in their totalities, on how the craft of filmmaking had performed comparatively. Now the home video would not come before April 2015. So, for my urge for the comparative study, I decided to take the route long forgotten when I picked up the movie in a theatre on Saturday, December 13. Now, in few hours, the 4 of 2014 would transition to 5 of 2015. So, while the three digits would remain the same, the fourth different one would cause the next cycle on the timescale to begin, like the eternal message of living that says – ‘tomorrow is built on today with learning from yesterday’ – remember, life is never a zero-sum game. It would be another calendar year with 365 new days to explore, to write, to read, to travel, to create new ideas, new stories, rewriting the oldies, clicking and capturing the known and unknown while continuing on the inward journey. With the freedom of ‘no resolutions’ – with the freedom of my commitment to my conscience to live every day meaningfully liberated – with the freedom to make every day an opportunity! TO READ THE JOY OF THE EVENING RAIN..
Life’s mystery, preserved in enigma of its moments.. The reflections are in-built in life, in its moments..
Every coming moment is unpredictable, unregistered..
And the attraction of it, and the approach to look at it.. Some times, it reflects in the looks you wear naturally.. When the mind speaks and the eyes express your soul.. When the unpredicted remains the accepted expectation.. When the enigma of unpredictable finds its match in you.. When the mystery of moments share the stage with you..
Let you be mystical enough for the next life has for you.. When I spoke to the sun. The heat sounded soft spoken. When I wrote to the moon. The darkness was wide and open. When I walked with the rain. The flow stepped in only to gain. When I talked to the terrain. The stillness had a slipping plane. When I slept in the fountain. The soul was in unison to restrain. When I ran on the mountain. The life looked at, ready to explain. 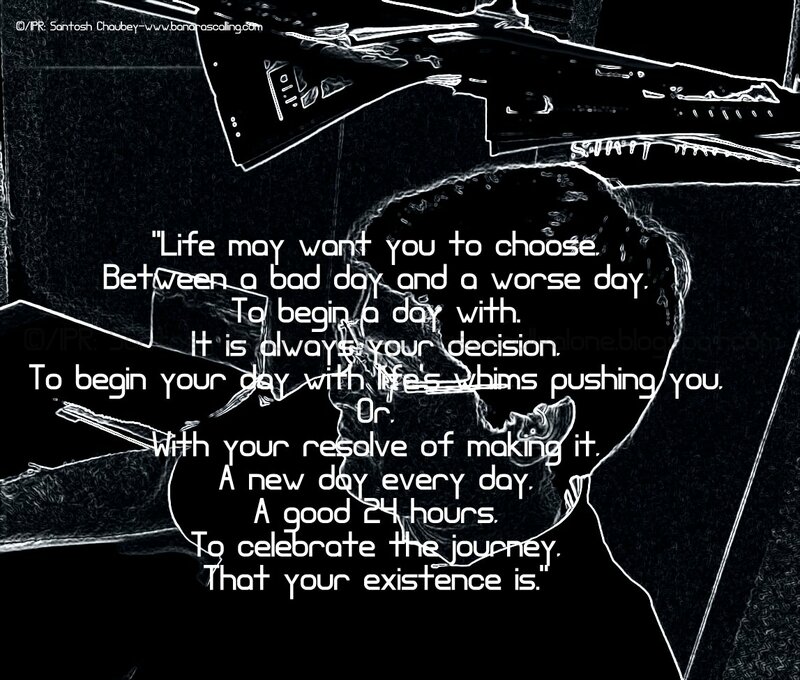 To begin a day with. If it breaks a life.. When life plays with you..
As long as it makes a life..